At Thistledown we believe it is important to help pet owners and pet care professionals recognize the reality that our pet’s lives are just too short compared to their own. We also believe that many pet owners are devastated when their pet does pass and that in many areas there is a lack of resources available to them to help them cope during that difficult time. It is for these reasons that we have held and participated in a number of events over the years, both at Thistledown and off-site, to help address this shortfall. Since 2002, Thistledown Pet Memorial staff has presented seminars at Community Colleges and Veterinary Clinics located within the Greater Toronto Area and beyond. This seminar program entitled “Acknowledging Pet Loss”, has proven helpful for those clinic staff who must deal with the stresses related to euthanasia and grief. These seminars (presented at the individual clinic) generally have required from one to two hours to complete. In addition to the “Acknowledging Pet Loss” seminars, Thistledown has also hosted field trips from Durham College veterinary technician and secretary courses. These field trips are designed to provide training for attendees in pet loss support techniques for pet owners. The field trips also allow attendees to observe firsthand the operation of a pet crematorium. For those pet owners who require some assistance in coping with the grief associated with their loss, staff at Thistledown can offer some telephone support and can direct them to our selection of books and articles written specifically about pet loss. We do not have professional grief therapists at Thistledown, however, for those pet owners who have exceptional needs in dealing with the loss, we can provide the names of individual grief therapists and support groups who may be able to help them through the grieving process. 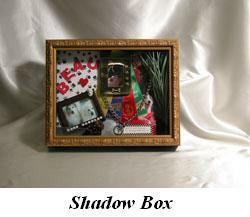 Making a Shadow Box can be fun as well as therapeutic. Workshops held at Thistledown Pet Memorial have proven to be very successful in both of these areas. The workshop includes preparation of one framed shadow box per participant, materials for assembling the box, additional supplies to complete the box, as well as instruction.